As any second of three children can tell you - it's tough to be in the middle. You are overlooked and underappreciated even though you are commonly the peace-keeper in the family and hold everyone together. There is a piece of drapery hardware that feels your pain. Curtain carriers have been overlooked and underappreciated for quite some time, but we decided to put an end to that today. Carriers are the center of the curtain track-curtain combination. They attach the curtain to the track, and a good carrier will slide along the track making the curtains easy to open and close. Different types of tracks need different kinds of carriers. At last count, we had over two dozen different types available on our website. Today we will introduce you to three of them, but stay tuned to this blog because there are more to come. 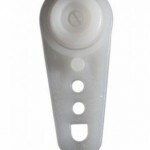 The 7118 Sew-In Button Carrier is unique in that it can be sewn directly onto the curtain panel – no hooks needed. 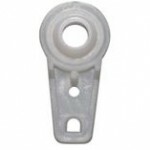 These curtain carriers are most often used in RVs, trailers, and boats, but they will work with any of our low-profile ceiling-mount tracks or ball-bearing tracks. Their unique design, including a crosshatch pattern in the tab, makes them easy to sew into the curtain panels, and allows them to move smoothly in the track. 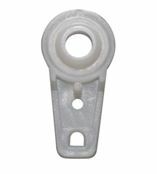 If you are looking to save space when your curtains are open, or “stacked,” our 84100 Ball Bearing Carrier has a slim design that allows the drapery to stack in 25% less space than other carriers allow. The rust-resistant alloy ball bearing inside these carriers make opening and closing the curtain panels a very smooth affair, and these particular carriers will last – they are strong and durable and a great choice for heavy drapery panels. So you want your curtains to take up even less space when stacked? Our 84102 Micro Ball-Bearing Carrier is, as the name implies, the smaller version of the ball-bearing carrier. This little curtain carrier packs a big punch – it is as durable as the full size carrier, but takes up even 20% less stacking space than its big brother. 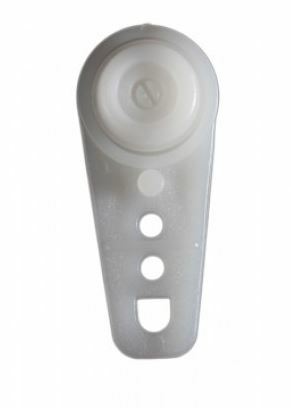 Both sizes of ball-bearing carriers are compatible with our 84003 and 84004 ceiling-mounted tracks, and have three hook-holes to give you some choice in curtain panel height. Stay tuned to this blog for more helpful information on curtain carriers! © 2018 Curtain Tracks Store. All Rights Reserved.